We spent Christmas in Portland with my family this year, but we still celebrated the Italian-American Christmas Eve feast, La Vigilia, or the feast of the seven fishes. It’s not certain where this tradition arose, but fish is symbolic in Catholicism (a symbol of rebirth) and it’s been said that the “lighter” meal on Christmas Eve is a form of abstinence in preparation for the greater feast on Christmas Day. Although, we don’t usually scrimp on the servings! And, why seven fishes? It’s most likely a religious reference, since seven corresponds to the number of sacraments, deadly sins, etc. While every family has their own traditions, typically you eat baccalà (salted cod fish), calamari, scungilli (conch), anguilla (eel) and escarole stuffed with anchovies. And, in Michael’s family, it’s mostly fried. Michael doesn’t even like fried fish much—particularly not baccalà!—but it’s tradition. So, we bought some salted cod, fresh Dungeness crab (my absolute favorite—Maryland crabs don’t even compare), shrimp, calamari, and escargot (in place of the conch). We made a delicious seafood salad filled with pickled vegetables, crab and clams. 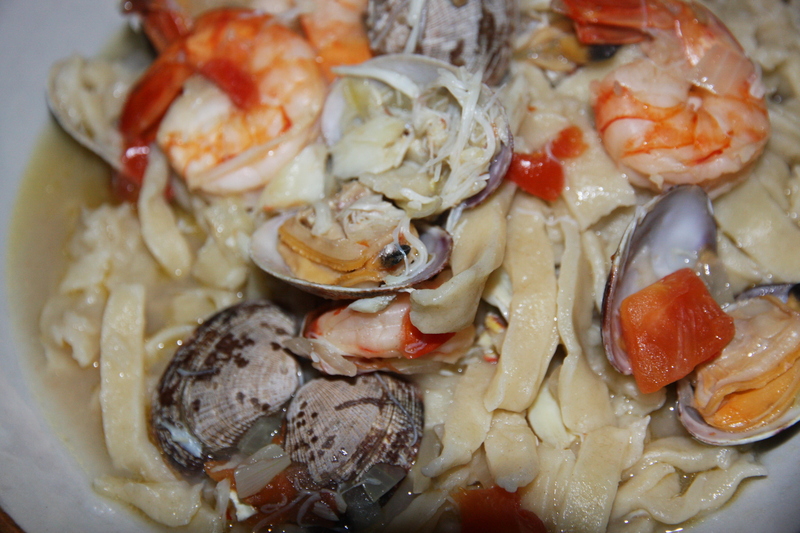 Next on the menu was pasta allo scoglio, with homemade linguine, crabs and clams, and pasta aglio e olio (oil and garlic). Michael’s family typically makes aglio e olio, but we wanted to honor Pesaro with one of its most popular dishes, pasta allo scoglio. Plus, the Dungeness crabs were too good to pass up. 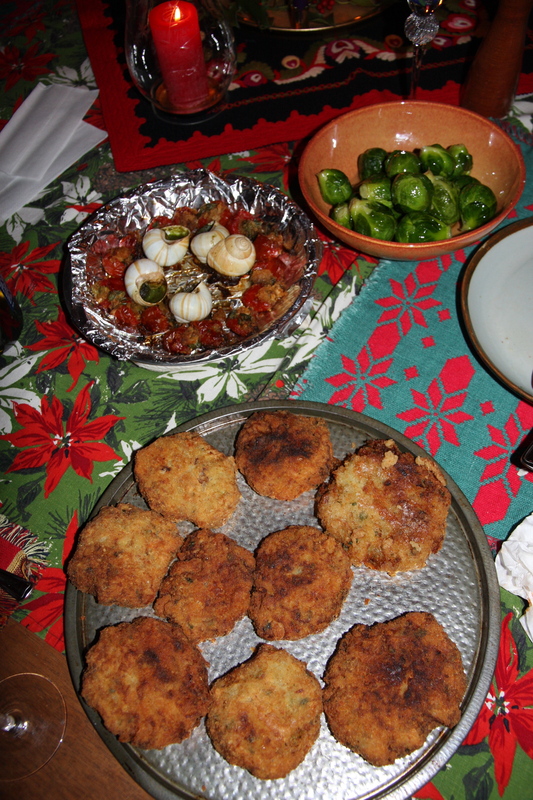 Then, we made fried calamari and a twist on the usual fried baccalà: baccalà/potato cakes. We looked for escarole but it was very difficult to find in Oregon—several stores had it on order, but nothing came in before Christmas. As an Italian-American from New Jersey, Michael always marvels that grocery stores don’t have baccalà or escarole readily available. They had to specially order the baccalà—a few days later it came packaged in a delicate wooden box—a far cry from the hanging baccalà in the supermarkets in New Jersey or in the pescherie in Italy. The last time we spent Christmas in Portland we just went to the Asian markets and found all the fish we needed! The meal turned out great as you can see in these photos. To learn more about the Italian Christmas Eve feast, read this article that Michael just published in the journal Food and Foodways. 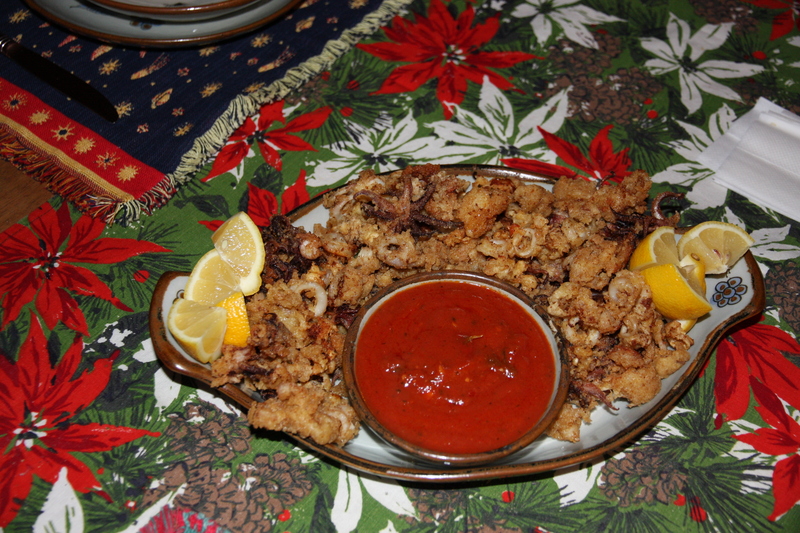 This entry was posted in America, culture, food, Italians, Italy and tagged baccala, Catholicism, Christmas Eve, culture, Feast of the Seven Fishes, Italian-American, Italians, Italy, New Jersey, Vigilia. Bookmark the permalink. Laura – you don’t know what your talking about when it comes to Maryland crab cakes. No other crab can compare to Maryland blue crabs. Perhaps in the years you spent in DC, you didn’t go to a true Maryland crab house. I must not have! I admit, I liked them a lot, but still have a preference for Dungeness. What can I say? I’m a west coaster at heart. Your short interchange has made us laugh. As he would have to admit, and does, he’s never had Dungeness crab. What can I (he) say? He’s a Baltimoron. We’ll have to try one next trip to Portland!